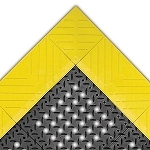 The 545 Diamond Top Interlock Floor Mat is made from a tough rubber material and features a diamond top surface for better foot traction and a secure waffle support system on the bottom for added comfort and ability to stand for longer periods of time in the workplace with less fatigue. 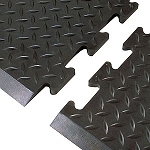 Slipping in the work area has always been an issue which is why implementing the diamond top surface on this floor padding will decrease those unwanted accidents. 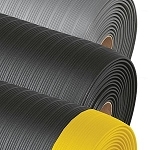 A thickness and a waffle support system on this rubber floor covering will provide that extra cushioning that allows proper blood circulation to minimize muscle fatigue and back discomfort increasing workers performance and production. 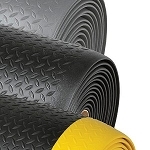 Easily clean safety mat with some water and mild detergent for a restored new look. This floor covering is available in two different dimensions and three different versions (Single, Center, and End) to meet all your customization needs.